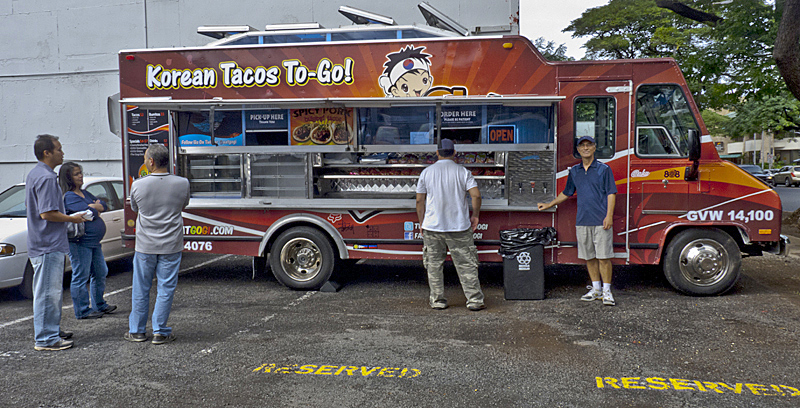 Gogi Taco Truck, Honolulu. Photo by Karen Glenn. A few weeks ago, Epicurious, the enormously popular food Web site, predicted that Korean cuisine would be one of the top ten food trends for 2011. “Evidence is mounting that smoky, piquant Korean is America’s next big cuisine,” wrote Epicurious editor in chief Tanya Steel. Well, if you want to taste the future right now, hop a plane to Honolulu, where Korean food, and many other aspects of Korean culture, are already an integral part of the multicultural landscape. Though Koreans have had a significant presence in Hawaii for decades, the recent infusion of all things Korean into Honolulu began in October of 2008, when South Koreans were finally spared the hassles of obtaining visas in order to visit the U.S. Since then, arrivals have quadrupled (though the number is still small compared to Japanese visitors). It hasn’t hurt that Daniel Dae Kim, one of People Magazine’s “Sexiest Men Alive” in 2005 and currently starring in the revival of the Hawaii Five-O television series, is Korean-born and living in Honolulu. But it’s the Korean food community that’s the most obvious lure for mainland visitors. While casual Korean buffets and fast-food outlets abound all over Oahu, the real dining action is centered on the half-mile stretch of shopping plazas and restaurants along Keeaumoku Street, which is adjacent to the glitzy Ala Moana shopping mall and about a mile or so from Waikiki. Here, on what’s being dubbed Koreamoku street, you’ll find everything from the shiny, brand-new Keeaumoku Supermarket, where much of the inventory will be deeply mysterious to non-Korean speakers, to beauty parlors, tiny kim chee emporiums, and Korean restaurants of every description. The open-all-night Sorabol is hard to miss, but the newer places are causing the most excitement. Orine Sarang Chae (905 Keeaumoku) has outdoor seating in a fenced-off parking lot and tableside grills for cooking meats. A few blocks away, on King Street, is Choon Chun (1269 S. King St.), where Korean-style double-fried chicken is the thing. Kim chee fries. Photo by Karen Glenn. Our absolute favorite Korean places are nearby as well. 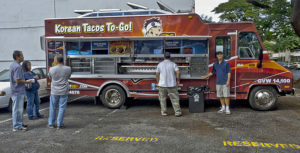 The Gogi Korean BBQ Taco Truck (eatgogi.com for locations) pays homage to the now-legendary Kogi truck empire in Los Angeles. There’s juicy, meaty kalbi tacos for just $2, but the must-order here is the kim chee fries, creamy fried potatoes topped with a pinkish kim chee aioli that you’ll be dreaming about for days. 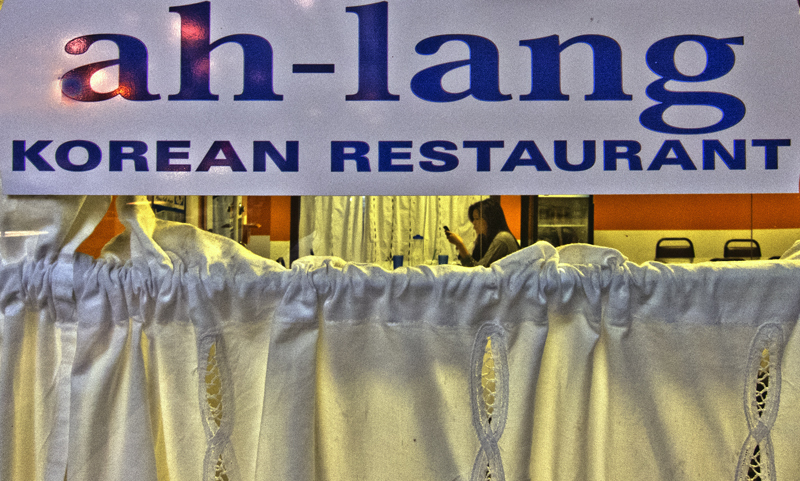 Ah Lang (The Angry Korean Lady). Photo by Karen Glenn. 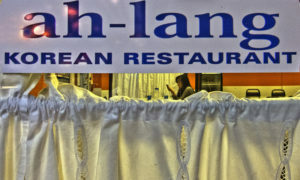 Then there’s the four-table restaurant whose sign says Ah Lang but which everyone, including the owner, calls The Angry Korean Lady (725 Kapiolani, angrykoreanlady.com). In truth, owner and chef Won Lam isn’t always angry, though she can be exasperated by diners who don’t know the drill, which includes writing out your own order if she’s busy in the kitchen, and fetching water glasses. (Reserving and ordering ahead are highly recommended). That said, she’s a terrific cook. We loved her kim chee fried rice, her pa-jeon, a plate-sized scallion pancake filled with seafood, and everything else. On the way out, we poked our heads into the kitchen to say thanks, and Won even broke into a big smile. Oh I love it! Great articles and photography! 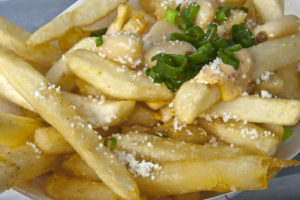 I’m not sure I will be able to rest until I get some kim chee french fries,two of my favorite foods! I was recently taken to Sorabol for the first time by my late 30’s something running partner who is a Korean Language and Asian Studies student (and Caucasian) at U of H. Loved the decor as well as the food! Have you tried Shillawon (sp?) nearby?